Are you a leader? Some folks believe everyone is a leader in one way or another. You may lead a multi-national organization or a team at work. You may lead a business unit or a pack of scouts. You may lead a volunteer organization or just be "mom" or "dad". In any case, you are a leader. I believe that I have a sure fire way to change and "go green" as a leader (without much controversy). Now, I don't mean that you'll lead in the dark because you've turned off your lights. Going green isn't simply about conserving energy and preserving the planet. 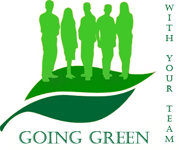 Going GREEN is about being a good steward of resources... not just fossil fuels and other resources from Mother Earth, but more importantly it is about being a good steward of your organizational energy and the resources within the people that you lead.